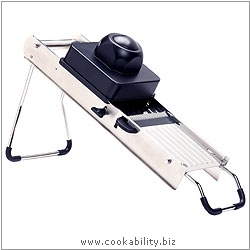 Professional stainless steel mandoline comes complete with a large piston handle safety guard. The mandoline is mounted on a sturdy non-slip stand. The legs are retractable for easy storage. Seven stainless steel blades are enclosed in a durable storage box: two grating blades, a straight edge master blade, a crinkle edge master blade and three differing width julienne blades. The mandoline comes with comprehensive instructions and is supplied gift boxed.